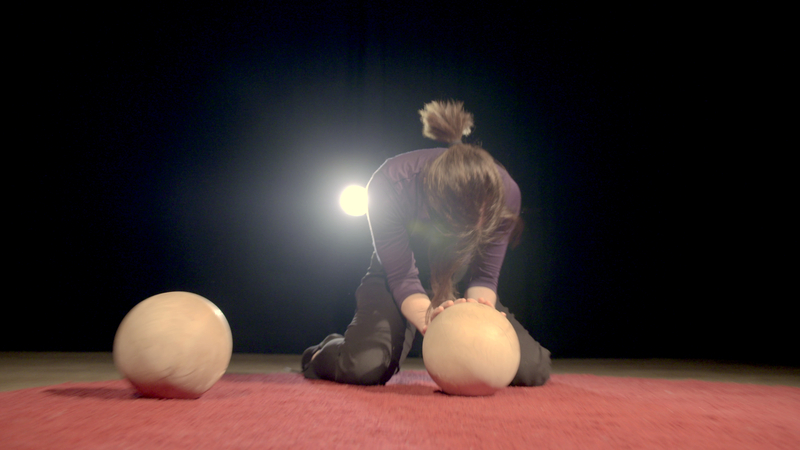 Boules is an interactive performance featuring spherically-shaped digital instruments manipulated by performers who create and modulate sounds through the movement of their bodies. The whole work is composed in real-time. This project received financial support from the CALQ for the research and creation of the installative component. Boulesis an interactive performance-installation featuring digital instruments in the form of heavy wooden balls that performers-dancers handle. Thanks to a system of sound synthesis that reacts to the direction and speed of movement of the balls, the work is written in real time from the movement of the bodies and their interactions with the instruments. Boules operates in a versatile minimal scenic context that requires very little setup time. This last characteristic, coupled with the material lightness of the work, allows the work not only to be easily transported, but also to adapt easily to a multitude of presentation contexts. This will take mainly the form of performance but may also include an “installative”context where the public would be invited to experiment the device or be offered in the form of workshops. In addition, Boules can lead to interventions in public places, in non-conventional or informal dissemination spaces, and even in guerrilla mode, allowing us to consider being able to rotate and travel the work abundantly, not only in Quebec. but also abroad.